While Boulder isn’t exactly known for water, look just beyond the city’s boundaries, and a world of adventure reveals itself. 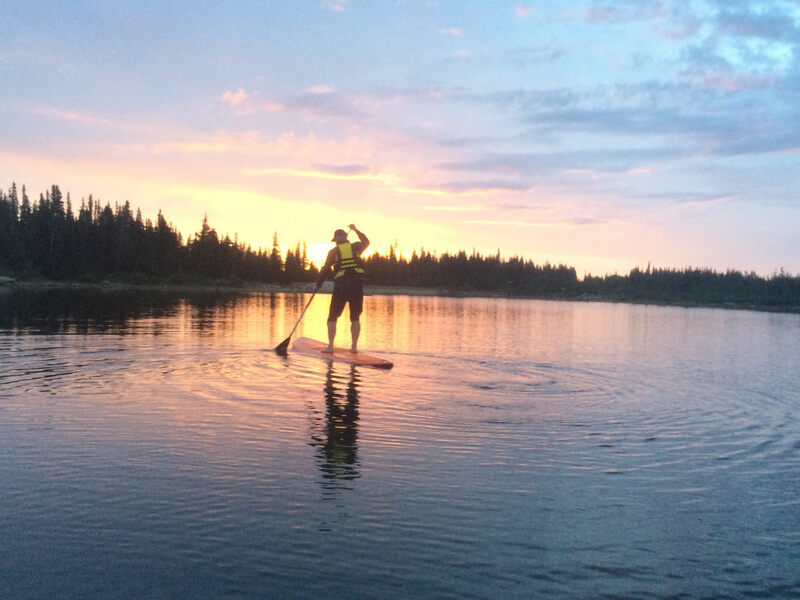 And there's no better way to take advantage of the last blast of summer to explore the region’s hills and plains by stand-up paddleboard. Even if you’ve scurried around these parts for years, you might not have checked out your familiar haunts from the perspective of a SUP. Open your eyes and mind, and you’ll delight in the sheer diversity of paddling options—from sleepy neighborhood reservoirs to stunning alpine lakes. 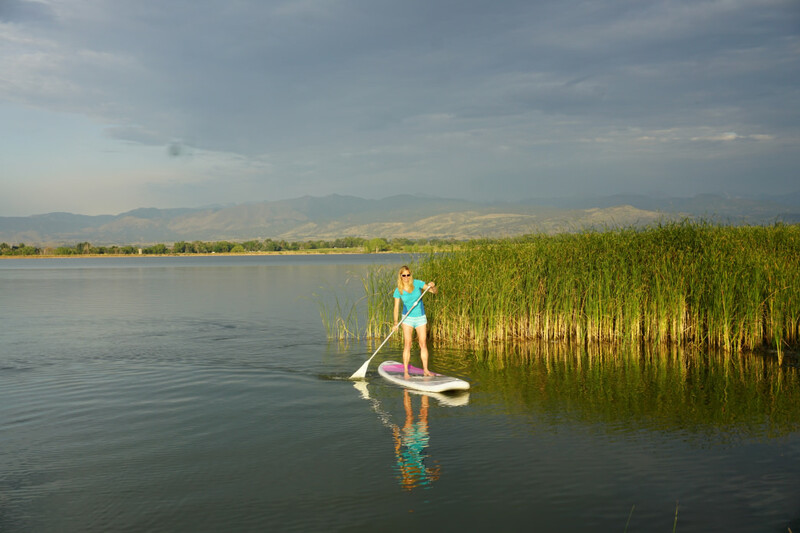 Here, some of the best places to SUP around Boulder, all beckoning for exploration as the sun sets on summer. In the morning, Boulder Reservoir is so smooth you can see every ripple. If you don’t have your own board, you can rent on on-site. Rocky Mountain Paddleboard sets up a tent in the morning and afternoon on the shore at Hobie Haven, right by the crew boats. (After Labor Day, they’re there all day until mid-October.) Just past Hobie Haven, the reservoir boathouse rents paddleboards throughout the day until Labor Day. 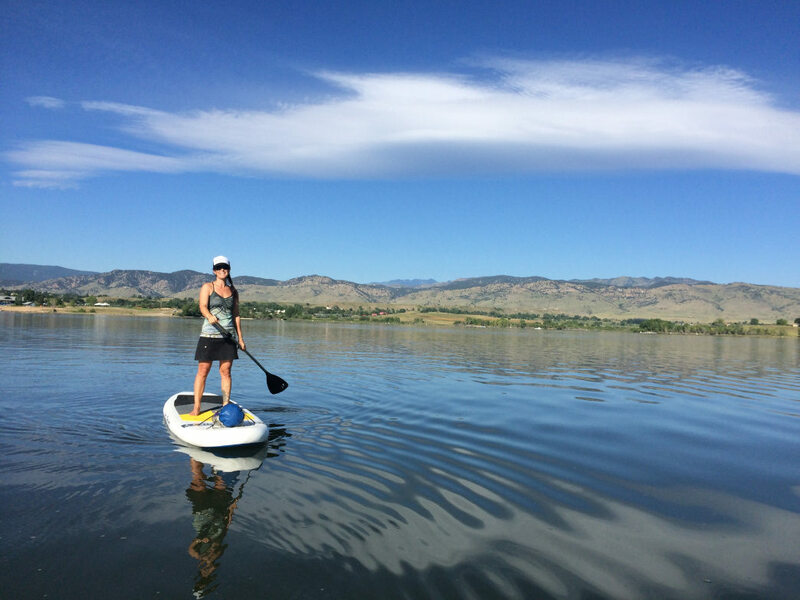 Boathouse rentals have to stay in the no-wake zone; Rocky Mountain Paddleboard lets you go farther afield. To get to the reservoir from Boulder, take the Diagonal Highway (CO 119) east to Jay Road. Turn left on Jay, then immediately right onto 51st Street. The entrance to the reservoir will be on your right after 2.3 miles. Once you pass the entrance gate, continue along the road past the swim beach and concession building to get to Hobie Haven and the boathouse. The entry fee to the reservoir is $6.25 per vehicle from Memorial Day to Labor Day; after that, it’s free (no dogs allowed). If you bring your own paddleboard, you’ll need a boat permit (boards are actually considered boats), which is available on-site and costs $40 annually. A quick inspection is required each time you come to the reservoir with your board. Insider Tip: Hit the res first thing in the morning for silky smooth waters and solitude. The wind sometimes picks up in the afternoon. Gross Reservoir's 11 miles of shoreline are a joy to explore. 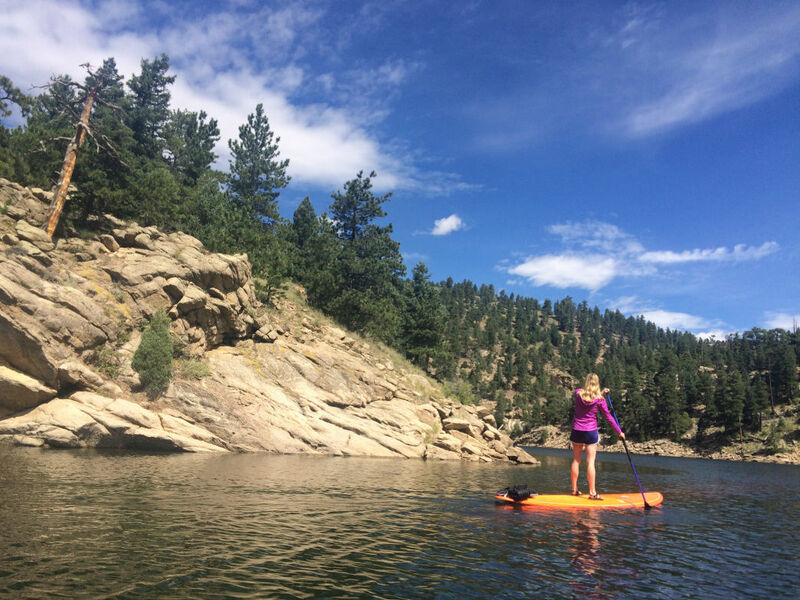 Mention Gross Reservoir to a longtime local and the response might be, “I didn’t know you could SUP there.” Well, you can—and it’s a dream. At 440 acres, Gross is less than two-thirds the size of Boulder Reservoir, yet feels huge thanks to 11 miles of shoreline, with long skinny fingers begging to be explored. Rocky outcroppings tumble down to the water’s edge, creating scenery so stunning, you’ll want to paddle along every nook and cranny of the shore. Northwest of the dam, look for high-peak views. To get to Gross, follow Flagstaff Road for 8 miles until it turns into Gross Dam Road. Turn left to get to the reservoir and follow signs for the Osprey Point boat launch on the south side (another 6 miles). Once afloat, you can paddle up a few fingers to the left. For a longer jaunt, head right toward the dam, then left up a long variegated shore. Boating season runs until September 30. Note: SUPs must be labeled with the owner’s name, address, and phone, and paddlers must carry a wearable type 3 life jacket and a whistle or horn-sounding device. No swimming is allowed. Insider Tip: This is an alpine lake, so weather can change fast. Avoid thunderstorms, which can kick up wicked winds. Before lightning strikes, head to shore. The rugged Indian Peaks form a stunning backdrop for Brainard Lake. To have the place to yourself, nab a campsite at Pawnee Campground and get up in the wee hours. Hit the lake at dawn and watch the early light creep up the mountains’ flanks while the sun sets the eastern sky afire. Brainard Lake is magical in dawn's early light. Get to Brainard Lake from Highway 72 near Ward. The boat put-in is at the east end of the lake. You can stash your car in the short-term parking near the day use area to unload your boat, then park in the main lot. There is a $10 per vehicle fee to enter. The road to Brainard stays open until mid-October or when the snow flies. Insider Tip: If you go on a weekend, reserve a campsite ahead of time. If you’re more of a spontaneous type, head up on a weeknight and grab one of the first-come first-served spots. The campground is open until September 13; a site costs $19. McIntosh Lake is a serene spot tucked in a sleepy neighborhood. McIntosh Lake is an unexpected escape: a 256-acre lake tucked in a sleepy Longmont neighborhood, with stunning views of Mount Meeker and Longs Peak. This is the place to go for a serene paddle away from crowds. Cattails and wildlife habitat rim the shore, attracting an abundance of birds, including great blue herons, cormorants, ducks, red-tailed hawks, and the occasional bald eagle (no swimming allowed, however: If you fall off your board, you're supposed to get right back on). Launch from one of the two boat ramps, one in Flanders Park on N. Shore Drive. To get there from Boulder, take the Diagonal Highway (CO 119) east to Airport Road and turn left. Turn right on 17th Avenue, left on Harvard Street, and then left on N. Shore Drive. Follow this for a half mile and park in the small parking lot on the left. From here, it’s a short walk down a path to the shore. The other boat ramp is in Dawson Park on Lakeshore Drive. Take the Diagonal Highway (CO 119) east to Airport Road and turn left. Turn left on Lakeshore Drive. Follow this for a half mile, park on the street at Dawson Park, and walk the path to the boat launch. Insider Tip: Dawn and dusk are the best times to spot birds. Keep your eyes peeled along the shore, but avoid the northwest corner, which is buoyed off for wildlife. If you need to rent a paddleboard to drive to one of these SUP stashes, visit Whitewater Tube Co. at 3600 Arapahoe. Full day rentals start when the shop opens at 10 am and are due back at 6 pm (or you can pick up your board between 5-6 pm the day before). Half-day rentals start at 11 and are due back at 5 Hint: If you’re going somewhere farther afield (like Gross or Brainard), go for the full-day rental so you aren’t rushed. 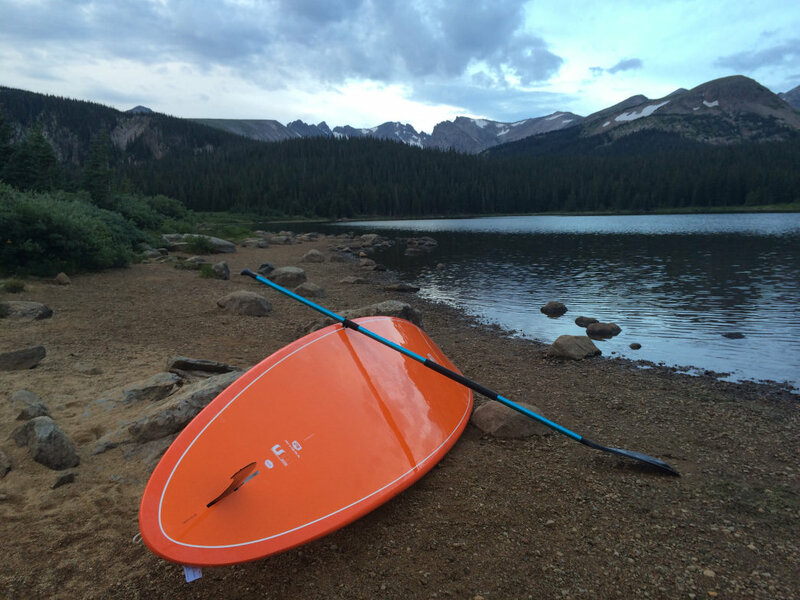 Rocky Mountain Paddleboard can also set you up with a board and gear.